I f you haven&apos;t had these guys into your school it can only be that you haven&apos;t heard of them yet. 30 children listened and worked from 9.05 to 12.00 without moving. Brilliant presentation, infectious enthusiasm and patient skill teaching. We all thoroughly enjoyed our time with Don and Kathryn. Outstanding quality learning, outstanding results. A wonderful experience for the children. The children felt a real sense of ownership and achievement over their work due to building the toy to completion and using functioning tools. 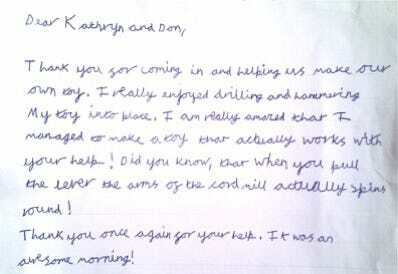 The children gained a great deal of enjoyment and satisfaction from the workshop. Don and Kathryn were exceptional leaders and set clear guidelines for the children. Behaviour and engagement were excellent. Being a special needs school, the needs of our children vary greatly in terms of their gross and fine motor ability. Every aspect of the session was accessible to all, providing them with opportunities to develop their skills at a level that was appropriate to the individual. This in turn gave all of the children a great sense of achievement. If you are looking for a fun, engaging and educational visit with two of the most patient and enthusiastic people leading the sessions then Toys In Schools is the company to book! Don and Kathryn&apos;s ability to differentiate the experience, assess the children&apos;s needs and provide a stimulating experience that covers a vast range of the curriculum is outstanding and I would highly recommend them to anybody looking for a hands on experience! As a teacher in a special needs school, it can be difficult to find people who understand our children&apos;s needs but it was clear within the first few minutes that Don and Kathryn knew how to engage every pupil, build fantastic relationships with them and also help them to create a toy that they could be proud of. All I have heard this morning is &apos;Where&apos;s the toy man? I need to make another toy!&apos; which is better than any review that I could leave! It enabled all of the children to use tools that some have never used before. It was an engaging workshop which taught many elements of the curriculum without the children realising they were learning. I really enjoyed the workshop, especially your lively nature with the children who all thoroughly enjoyed themselves. Thank you so much for another fabulous day. The children totally love their toys and were talking about the workshop for the rest of the week.